Heng Long 1:16 German Tiger 1 Tank With Smoke And Sound Radio Control RC Tank The real Tiger I was a German heavy tank used in World War II, produced from late 1942 as an answer to the challenge of facing the unexpectedly formidable Soviet armor encountered in the initial months of Operation Barbarossa. The Tiger I design gave the Wehrmacht its first main battle tank that was capable of using its most formidable piece of ordnance, the 88 mm gun, which had previously showed its convincing effectiveness against both aircraft and other tanks. The Tiger differed from earlier German tanks principally in its design philosophy. Its predecessors balanced mobility, protection, and firepower. Tiger I represented a new German approach that emphasised firepower and armour at the expense of mobility. This fantastic scale radio controlled replica from Heng Long looks great and is feature packed. The highly detailed finish adds to the realism and the included commander figure completes the model perfectly. The tank fires plastic bbs and is the upgraded version with a built in real smoke generator and sound effects. 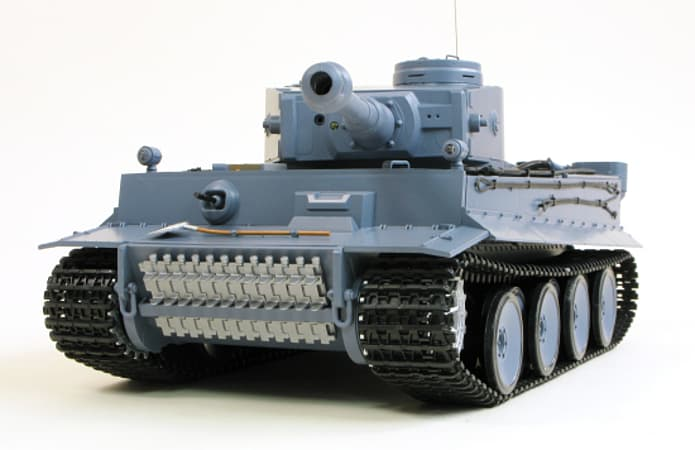 Sound effects include emulation music, motor start-up, engine, machine-gun and cannonball when it fires a bb All functions of the rc tank are controlled from the included transmitter. The tank can go forward and backward at two different speeds and the real working tracks mean it can be rotated any way. The turret is also fully controllable and can be rotated as well as moving the gun up and down.